If you have ever known someone who has been affected by breast cancer, then you know how devastating it can be. Cancer in general is a nasty word and not one that people like to hear. Anytime I hear of someone who has it or has been through it, I immediately think of several things...chemo, radiation, hair loss, weight loss, sickness and death. It is an awful disease and one that deserves fighting. This is why I am really excited about a new challenge that Yoplait has started. 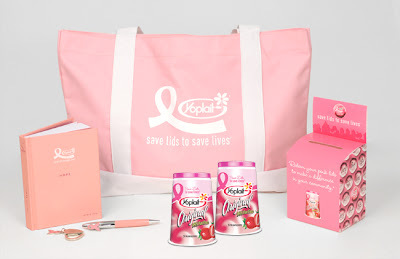 It is called Yoplait Save Lids To Save Lives and it has the potential to contribute millions to the Susan G. Komen foundation for funding and fighting breast cancer. Recently, I wrote about a young woman who was fighting for her life and struggling to overcome breast cancer. She was initially diagnosed in 2008 and went through treatments. After her remission, her cancer returned with a vengeance in 2010. 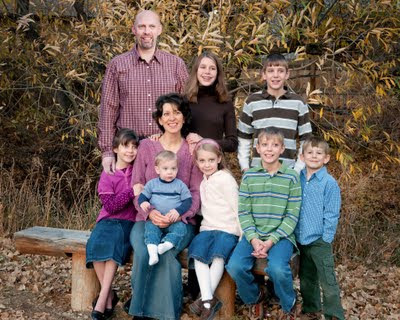 Her name was Amy Bixby and she was the mother of 7 beautiful, young children...her fight with breast cancer tragically ended on Friday, August 19th, 2011 when she passed away. Sadly, this is only one story in thousands. Day after day, women are being diagnosed with breast cancer. Some live for years, some for months and some for weeks. It is not something to be looked at lightly and cancer affects EVERYONE in a family, not just the patient. So, this campaign by Yoplait means a great deal to me as Amy's passing was just over a month ago. How real it is and how special to have a part in the cure. Here is how it works. Whenever you purchase a pink-lidded Yoplait Yogurt (any flavor) and then send that lid into Yoplait, they will donate $.10 (up to $2 million) to Susan G. Komen for the Cure. It is as simple as that. To make it easier, you can also enter your lid codes online as well. This is really convenient for me as I don't get out much these days. I would encourage you to show your support for Susan G. Komen for the Cure. Someday, you may need their help and you will be thankful that you helped out when you did. Collect the lids and send them in. Every lid counts and like I said before, the potential is tremendous!!! Leave a comment telling me if you know anyone who has suffered from cancer and which Yoplait flavor is your favorite. :) You do not have to be a blogger to enter, but you must have a valid email where you can be reached should you win. If you do not leave an email address, it must be where I can easily find it. This giveaway is open to US residents and will end 10/14 at 11:59 pm EST. The winner will be chosen using random.org and will be notified by email. The winner will have 48 hours to respond, or another winner will be selected. 1. "Like" Yoplait on Facebook. 2 entries, so 2 comments. 2. Follow Yoplait on Twitter. 2 entries, so 2 comments. #win Yoplait Save Lids To Save Lives Prize Pack @YoplaitYogurt and @coupons4moms Ends 10/14 http://tinyurl.com/3kczp5k #MyBlogSpark! Disclaimer: I received no monetary compensation for this post. I did receive free Yoplait Save Lids To Save Lives Prize Pack for review purposes. The Yoplait prize pack, information and coupon have been provided by Yoplait through MyBlogSpark. All thoughts and opinions are 100% mine. my aunt dies of breast cancer and my father died of oral cancer. IT is time we find a cure. my mother almost had breast cancer but she found a lump through early detection. I tweeted this giveaway...danadenay..dmatthews38751@yahoo.com #win Yoplait Save Lids To Save Lives Prize Pack @YoplaitYogurt and @coupons4moms Ends 10/14 http://tinyurl.com/3kczp5k #MyBlogSpark! Yes, I know a number of cancer survivors and their courage is outstanding. Mixed berry is my favorite flavor. Fortunately, no one I know has suffered from Breast cancer. My favorite flavor of Yoplait yogurt is Harvest peach. I like the Yoplait Light Strawberry Banana. I don't know anyone personally that has had breast cancer, but lung, brain, skin cancer, and leukemia have affected people in my lives. My husbands grandmother had breast cancer, she was a 20 year survivor. My favorite flavor is Strawberry. A good friend of mine is a breast cancer survivor and I like key lime pie flavored yogurt. I follow you on twiter as kmayans. The pineapple flavor is my favorite!